PCR is used to amplify a specific region of a DNA strand (the DNA target). Most PCR methods typically amplify DNA fragments of up to ~10 kilo base pairs (kb), although some techniques allow for amplification of fragments up to 40 kb in size. Two primers that are complementary to the 3' (three prime) ends of each of the sense and anti-sense strand of the DNA target. Deoxynucleotide triphosphates (dNTPs), the building-blocks from which the DNA polymerase synthesizes a new DNA strand. Figure 2: Schematic drawing of the PCR cycle. (1) Denaturing at 94–96 °C. (2) Annealing at ~65 °C (3) Elongation at 72 °C. Four cycles are shown here. The blue lines represent the DNA template to which primers (red arrows) anneal that are extended by the DNA polymerase (light green circles), to give shorter DNA products (green lines), which themselves are used as templates as PCR progresses. Initialization step: This step consists of heating the reaction to a temperature of 94–96 °C (or 98 °C if extremely thermostable polymerases are used), which is held for 1–9 minutes. It is only required for DNA polymerases that require heat activation by hot-start PCR. 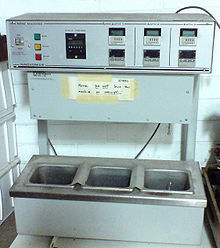 Annealing step: The reaction temperature is lowered to 50–65 °C for 20–40 seconds allowing annealing of the primers to the single-stranded DNA template. Typically the annealing temperature is about 3-5 degrees Celsius below the Tm of the primers used. Stable DNA-DNA hydrogen bonds are only formed when the primer sequence very closely matches the template sequence. The polymerase binds to the primer-template hybrid and begins DNA synthesis. Extension/elongation step: The temperature at this step depends on the DNA polymerase used; Taq polymerase has its optimum activity temperature at 75–80 °C, and commonly a temperature of 72 °C is used with this enzyme. At this step the DNA polymerase synthesizes a new DNA strand complementary to the DNA template strand by adding dNTPs that are complementary to the template in 5' to 3' direction, condensing the 5'-phosphate group of the dNTPs with the 3'-hydroxyl group at the end of the nascent (extending) DNA strand. The extension time depends both on the DNA polymerase used and on the length of the DNA fragment to be amplified. As a rule-of-thumb, at its optimum temperature, the DNA polymerase will polymerize a thousand bases per minute. Under optimum conditions, i.e., if there are no limitations due to limiting substrates or reagents, at each extension step, the amount of DNA target is doubled, leading to exponential (geometric) amplification of the specific DNA fragment. 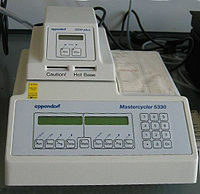 Final elongation: This single step is occasionally performed at a temperature of 70–74 °C for 5–15 minutes after the last PCR cycle to ensure that any remaining single-stranded DNA is fully extended. Final hold: This step at 4–15 °C for an indefinite time may be employed for short-term storage of the reaction. Figure 3: Ethidium bromide-stained PCR products after gel electrophoresis. Two sets of primers were used to amplify a target sequence from three different tissue samples. No amplification is present in sample #1; DNA bands in sample #2 and #3 indicate successful amplification of the target sequence. The gel also shows a positive control, and a DNA ladder containing DNA fragments of defined length for sizing the bands in the experimental PCRs. 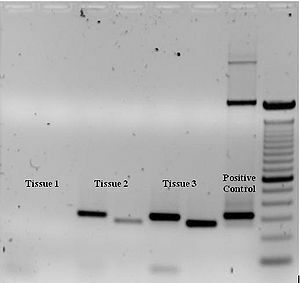 To check whether the PCR generated the anticipated DNA fragment (also sometimes referred to as the amplimer or amplicon), agarose gel electrophoresis is employed for size separation of the PCR products. The size(s) of PCR products is determined by comparison with a DNA ladder (a molecular weight marker), which contains DNA fragments of known size, run on the gel alongside the PCR products (see Fig. 3). Levelling off stage: The reaction slows as the DNA polymerase loses activity and as consumption of reagents such as dNTPs and primers causes them to become limiting.